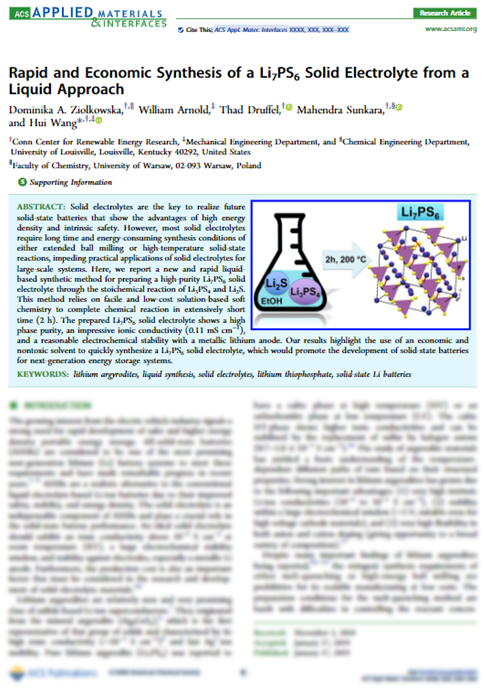 Safety issues are of enormous concern in developing advanced energy storage systems, especially lithium technologies. Commercial Li-ion batteries contain flammable organic liquid electrolytes and corresponding technical challenges; most incidents involving Li-ion batteries were caused by the ignition of the electrolyte. The main aim of this proposal is to assemble a completely solid-state cell using an inorganic Li-ion superconductor to benefit from its superior electrochemical, mechanical and thermal stability, the impossibility of leakage, and the possibility of battery miniaturization. Today, Maciej and Justyna joined in our first Group Meeting. Since now we will meet together on a biweekly basis discuss current results, new directions, new literature findings to stayed tuned with other researchers. They both presented short reports about their field of interest (literature search and first results). We have a really great scientific brainstorm and I hope it gave them as much of an additional motivation as I gained today. I am always looking for new team members, especially PhD and Master students. If you are an engineer or bachelor student also feel free to contact me for more information.